After 30 minutes on the treadmill this morning I fixed myself a big bowl of yummy goodness for breakfast. Something about oatmeal and peanut butter in the morning sticks with me all day. I cooked 1/2 cup oats in 1 cup almond milk. 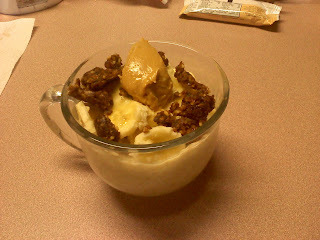 Topped it off with 1/2 banana, 1 tbsp peanut butter, and 1/2 apple pie Larabar. Great start to the day!